Use of charred biocarbon in soil goes back 6000 years. In the Amazon, “Terra Preta” are the famous rich, fertile, black soils with carbon residues from centuries of indigenous cookfires. These soils stayed fertile for centuries, even under intensive cultivation. Carbon is a key ingredient for soil and life. Fully fertile soil requires mixing and blending of many diverse ingredients, carefully brought together to create healthy, functional Soil Food Web. Terra Char operates a facility to make “biochar,” a key ingredient in Terra Preta. Biochar aids crop yield, water retention, soil structure, soil health & nutrient content. By pyrolosis, we create Terra Char soil enhancer, compost aid and animal feed supplement. We offer Midwest growers materials & methods to boost soil carbon, balance soil minerals & revive soil microbes. Terra Char biochar is charged with minerals & trace elements, inoculated by fungi & bacteria, available in 1-gallon bag, 5-gallon bucket, half-ton tote, and semi-trailer. Terra Char offers access to ingredients, recipes and technical guidance to restore life to Midwest soils, nutrients to Midwest crops, and profitability to Midwest agriculture. Biochar is lightweight because it’s empty inside. 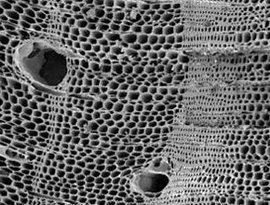 Seen in a microscope, biochar is very porous, filled with microscopic pores (microphoto at left), because plants are mostly hollow tubes and pipes to move water around. Like a sponge, biochar absorbs and retains water and nutrients, and provides space for microbes to live in soil. Thus, biochar keeps water and nutrients in the roots zone, making them available to plants, reducing their leaching and loss.